Living Hope Fellowship out of Ortonville, MN selected Buy Direct Signs for their recent church sign purchase. We had a chance to work face to face with them because they are only about an hour away from our office and production facility. That was nice for us because usually we conduct all of our business over the phone! 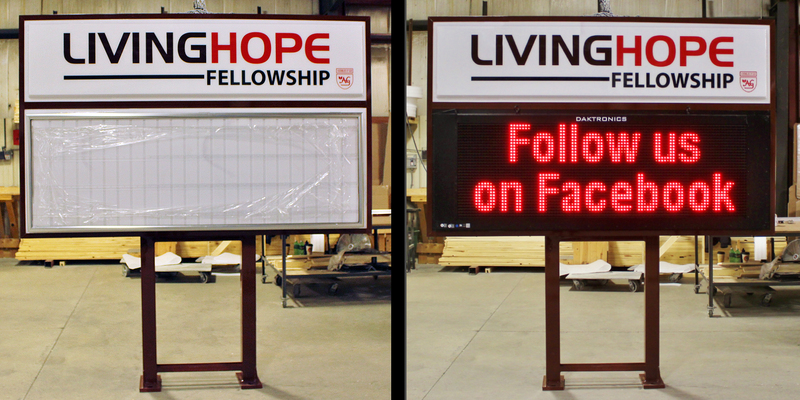 Living Hope Fellowship really wants an LED sign, but with their current budget it just wasn’t possible at this time. However, in working with them, we developed a new product called the Action Series Plus. This accomplishes two things – it provides them a new sign that is within their current budget. And the sign is designed so that when they are ready, they can easily swap out the changeable readerboard and replace it with a new LED message center. They’ll be able to do this in a very economical way and they’ll even be able to do all of the installation on their own! Watch this video to hear about their thoughts on our company and the experience they had working with us. Watch this video to observe the installation process and how quick it went! Only 45 minutes to install it after the sign arrived. Check out this video to learn more about the Action Series Plus sign and how easy it is to convert your sign to an LED message center!